When you make it your life’s work to help defend the labour rights of seafarers – still among the world’s most marginalized and isolated workers – it’s a joyful day when you and your colleagues around the globe are handed a new tool in the fight. It’s an even more joyful day when you get to be the first to use it. Canada and the ITF’s Canadian inspectors hold those big, bold, beautiful bragging rights. On Aug. 22 of 2013, Canada detained the first ship ever held under the new Maritime Labour Convention – just two days after the MLC came into effect. As we pointed out earlier this week, Canada was trained up and ready to hit the deck that Aug. 20 as the convention kicked in. And that proved to be a good thing. On Aug. 8, 2013, Canadian ITF coordinator Peter Lahay was contacted by ITF Inspector Sven Hemme from Bremerhaven in Germany. Sven wanted to let Peter know that he had made a wage claim against the notorious Polembros Shipping. The bells went off immediately. For many years, the world’s ITF inspectors had had Polembros in their sights. The company had a reputation among inspectors as a very difficult employer that would sometimes sign collective bargaining agreements — perhaps to satisfy the charterer, for example — but would never honor those CBAs. They were serial abusers of crew. Over the years, countless Polembros vessels were subject to backwage claims by our inspectors. While Sven was on the vessel at the Port of Wilhelmshaven near the city of Bremen, he determined that the ship was covered by a collective agreement signed by our Greek affiliate, the Pan-Hellenic Seamans Federation. A CBA specifies all terms and conditions of work, including hours of work and a wage for each position aboard. The CBA is quite specific on hours of work for ratings and officers. Let’s use an Able Bodied Seaman for our example. The CBA in front of Sven required that an AB earn $1436 US for a 276-hour month. Polembros was paying the ABs only $780 for a 298-hour month. So effectively, the AB had to work 22 hours more per month than he should have to earn $656 less than he was owed. Over the course of a year, which is how long the AB would likely be aboard, he would be cheated of more than $8000 out of the minimum of $17,232 he would earn over the course of the 12 months. Given the number of hours at often brutal toil that seafarers put in, it’s disgraceful to calculate that an AB would be cheated out of at least 45 per cent of their salary. In our world, we often find that it’s the lower ranks who are cheated of their rightful earnings. Farther up the ranks and qualifications ladder, seafarers are not usually making anything below the rates provided in any given CBA. For Polembros to be ripping these guys off by as much as 45 per cent was a wicked kick in the teeth. Even under the ILO’s own minimum wage scale of 2013, an AB was entitled to $1028 – still an appallingly small amount. So these buggers at Polembros were really having it their way. Long story short: Sven did his wage claim and submitted a bill to the owners for $60,137. He also told them they had to rewrite all of the crew employment contracts that fell below the standards stipulated in the CBA, and to make them reflect those terms and conditions. Well … the Hydra Warrior slipped away from Wilhelmshaven before the crew were repaid or the employment contracts were amended, but Polembros promised that everything would be made right before the ship got to its next port: Sept-Iles in Quebec. Its ETA was Aug. 22 or 23rd. With good reason, Sven didn’t trust the company. So he contacted Lahay in Vancouver to alert him. It was unfortunate timing for the ITF’s crew in Canada; the inspector for Quebec was away on summer vacation. But Lahay had noted that the vessel was due to arrive two days after the MLC would come into force in Canada. He had also helped train and brief Transport Canada’s port state control officers to get them ready to enforce the MLC. So Lahay decided to let them know the Hydra Warrior was inbound and that the crew had been cheated. And then Lahay filed what’s known as an “onshore complaint” under the MLC’s Title 5, Compliance and Enforcement. And that triggered an inspection. 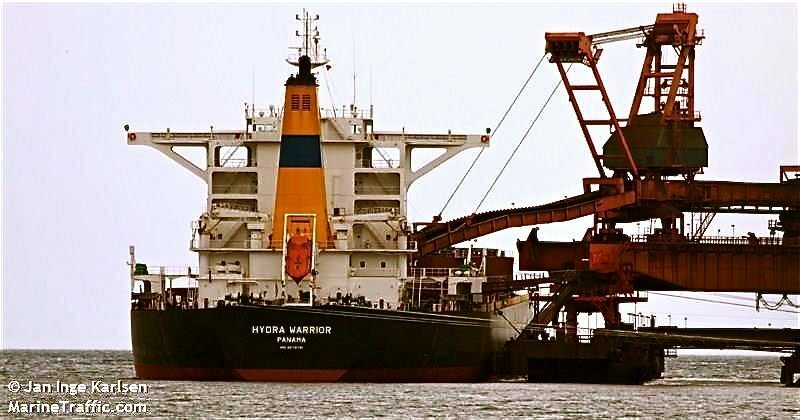 He told them that the company had acknowledged they were cheating the crew and that the crew had been forced to sign illegal employment contracts cheating the men out of at least 45 per cent of their lawful earnings. We kept in contact with the TC officers while the vessel was crossing the Atlantic, and provided them with copies of the relevant documents, wage calculations and a copy of the CBA in force. When they boarded on Aug. 22, they found that the crew had not in fact been paid the corrected salaries calculated as owing by Sven — and that the company had not completed new employment contracts detailing the lawfully entitled wages and hours of work for crew to sign. Nor did it appear to the TC officers that the owners had any intention of paying up, unless someone came aboard and demanded they do so. On the safety front, there were deficiencies in the way the mandatory ISM – a safety-management system – was being implemented, and the officers ordered that an internal safety audit be done and corrective action be carried out within three months’ time. Transport Canada issued a detention order at 12:35 p.m. on Aug. 22nd of 2013. It was just two days after the convention came into force — and was the world’s first-ever detention of a ship under provisions of the Maritime Labour Convention. We have always wished we had been there to see the faces at Polembros when the detention was ordered. We suspect they were startled that someone had even bothered to make an issue of the money — and were probably doubly startled that the push was coming from port state officers conducting an MLC-2006 inspection on the basis of a shoreside complaint under Title V of the convention. A brave new world had begun. Needless to say, we are extremely proud that the detention took place in our country. If you’d like to read the historic detention order, you can find it here. We find it pleasingly ironic that it was a Polembros Shipping vessel that took the honors of the first ship ever detained under the MLC. How deliciously appropriate. It felt like a real moment of justice for every seafarer the owners had ever screwed. And we were happy as well to see the work of our colleague in Germany through to completion. He took on a giant. And because he did, we all won. As Sven later said, it was “an incredible example of international cooperation”. A footnote: We can report that the Hydra Warrior has since changed its name to the New Warrior. But we’d be surprised if the New Warrior is any better than the scummy old Warrior. Owners can run but they can’t hide: all ships maintain the same IMO identification number throughout their lifetime, no matter how many name changes they experience. The Hydra Warrior will live on in history as 9579781. A more important footnote: Transport Canada port state control officers, now our social partners in ensuring that seafarers are treated properly, ought to get a plaque on a wall somewhere in Ottawa for their work in this case. We will be forever appreciative of the responsible, respectable, historic work they did in making the world’s first MLC detention, and it would be a fitting reward for them. Excellent series of articles. This should be used as a primer for anyone interested in the MLC. Thanks Terry, we appreciate the positive feedback. One of the reasons we undertook this project was to put in one place an analysis and an opinion of the MLC so far. It is still early days for the convention and we agree with Katie Higginbottom of the ITF: This convention will become a living and breathing backstop for seafarers rights when they as a whole embrace the convention and use it themselves. To do that will take continued efforts in education and organization of this marginalized workforce. As always, we thank you and ILWU 400 for your strong support and also to all of the Canadian maritime unions. As we have said during the week, none of this work would or could happen without all of you.